Galaxy Note 9 Case,WATACHE Slim Fit Heavy Duty Soft TPU Case with Metal Finger Ring Grip Holder Kickstand [Support Magnetic Car Mount] for Galaxy Note 9(Blue) by WATACHE at DJ Luu. MPN: ASX0187. Hurry! Limited time offer. Offer valid only while supplies last. Exact Fit: Compatible with Samsung Galaxy Note 9 2018 Release Only, Not fit for Galaxy S9 Plus/ Galaxy S9+/Galaxy S9. 360 Degree Rotation Ring: Galaxy Note 9 cover with ring holder, the ring is 360 degree rotating swivels for secure grip and personalized comfort hands-free use and versatility. 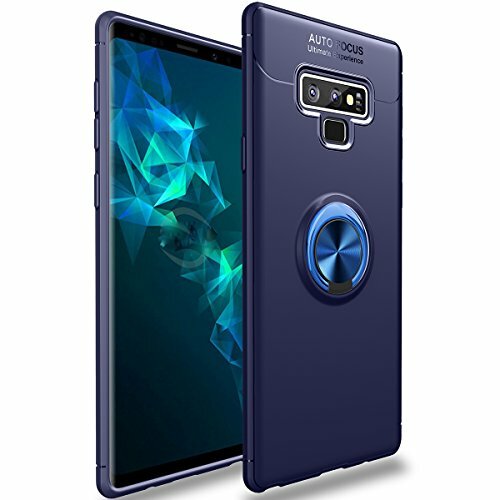 Kickstand Design: Galaxy Note 9 case with kickstand, built-in metal finger ring, double as reinforced kickstand for a hands-free viewing experience. Work with Magnetic Car Mount: Build-in metal iron plate, can be attracted to a magnetic car mount holder (NOT INCLUDED), no complex installation steps, direct adsorption. Sleek Single-Piece: Ultra slim yet durable, made of premium TPU material for long-lasting protection, with interior spider-web pattern for dissipating heat.